1,193 cM shared across 46 DNA segments, predicted relationship first cousin, extremely high. The next closest match is my nephew (1,562 cM across 58 segments) so this other match is pretty close. I have only one known first cousin, as my mother (86) had one sister (79) who had one son (44). The age of this match is 31; I am 62. He and I share matches from BOTH my maternal grandmother and maternal grandfather's side. This all screams "FAMILY SECRET"! Based on the amount of our shared DNA, is this match more likely the product of an unknown third child of my grandparents, born between my mother and my aunt, perhaps put up for adoption? Age-wise, this match could be that offspring's grandson, my 1C1R. Or, a child born out of wedlock to my aunt (possible, but I think I would have heard about) and this would be her grandson, also my 1C1R? Which makes most sense with the numbers, or are both possible? I now have my nephew's (brother's son) shared DNA with this match is 751 cM. My daughter's is 560 cM. What does that tell us? You're starting off with a doozy of a match. Yep, something's going on here. We can rule out great grandparent based on your age difference with the match. Grandparent is not very likely but is possible...only if a child of yours (probably a son) had a child as a teen, who then had a child as a teen). If you had a half sibling you didn't know about, this match could be their child, making you a half aunt. If you had a full sibling you didn't know about, this could be that child's child, making you a great aunt. If your mother had a half sibling you didn't know about, you could be their half niece. The age difference makes this extremely unlikely to the point of ruling it out. Your match can not be the child of your mother's half sibling because a half 1st cousin has a range of only 137-856 cM. You can also mostly rule out this possibility because your match shares matches with you for both sides of your mother's heritage. A half sibling of hers would not. If your mother had a full sibling you didn't know about, a child of that sibling would be your 1st cousin and that would fit. That sibling would have to be younger than your mother. But your match can not be the grandchild of your mother's full sibling because a 1st cousin once removed has a range of only 141-851 cM. Another possibility is your known aunt had a child at age 48 who she gave up for adoption, or sent off with friends or relatives and didn't tell anyone. It's unusual but not unheard of to have a child that late. And I can see people not wanting to raise a new child at that age. It's also possible this child would have a different father from your known 1st cousin (it makes no difference to your match). At this point, you need more data. Hopefully your match will respond to you and tell you the relationship, or give you a few clues. You also want to test other relatives and see what cMs they have in common with your new match. Ask your nephew to report his cM total with this match! It's even better if 3 of you upload to Gedmatch.com, though I realize that can be tough to get people to do it (it's not hard and it's free though). What's the most likely scenario here? I'd say it's that you have a half sibling and this is that half sibling's child. But it could be other things, so keep finding evidence and narrowing things down. Questioner has updated that her nephew's (brother's son) shared DNA with this match is 751 cM. Now the job is to figure out the (adjusted) relationships you can both have. 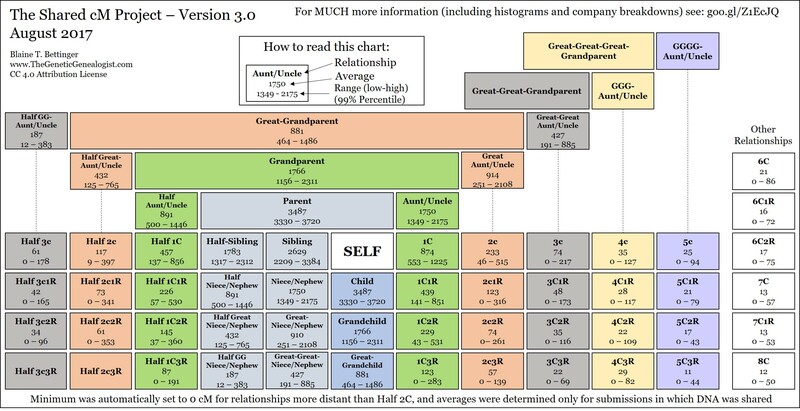 There is a tiny chance this is your grandchild (since I don't know the ages of your kids, if any), which would make your nephew's relationship 1C1R, which fits. If the match is your half sibling's child, it would be your nephew's half 1st cousin. Fits. If the match is your full sibling's grandchild (but not your brother's grandchild), it would be your nephew's 1C1R. Fits. If the match is your brother's grandchild, this would make your nephew the match's uncle or half uncle. Uncle is impossible but half uncle fits. This would mean that your nephew has a half sibling and this match is that half sibling's child. If the match is the child of your mother's full sibling (your known aunt or someone you don't know about), your 1st cousin, this would make your nephew a 1C1R, which fits. Unfortunately, your nephew's DNA rules out only one small possibility out of several. Your brother's DNA would help. And your mother's and aunt's, if they're still alive (and if you can ask them, maybe they'll tell you the family secret). Thus, the likeliest explanation is that Linda's mother had a child with a man who was not Linda's father and that this unknown half-sibling had a child who is the match. Credit is due to Cyn for their hypotheses.